Having worked with the Wounded Warrior Program, I am constantly reminded that these servicemen and women are our true heroes, and deserve all the support we can give them. I am very proud of how our community, and our country have recognized their sacrifices and the need to provide them total support. Broader research reveals exceptional heroes, both past and present, who have performed extraordinary acts of individual gallantry. These are the individuals who merit our nation's highest honor, the Medal of Honor. The first formal system for rewarding acts of individual gallantry by American soldiers was established by George Washington on August 7, 1782, when he created the Badge of Military Merit. It evolved to a Certificate of Merit in 1847 (Mexican-American War). The Certificate was later granted medal status as the Certificate of Merit Medal. Senate Bill 82, was signed by President Abraham Lincoln and went into law on December 21, 1861. This bill contained a provision for a “Medal of Honor” for use by the Navy. Shortly afterward, a resolution of similar wording was introduced on behalf of the Army, and was signed into law on July 12, 1862. 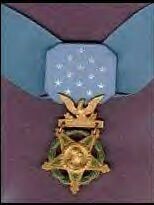 The Medal of Honor has evolved in appearance since its creation in 1862. It is one of two military neck order awards issued by the United States and is the sole neck order awarded to members of the armed forces (the Commander’s Degree of the Legion of Merit is also a neck order but it is only authorized for issue to foreign dignitaries). There is a version of the medal for each sub-cabinet component of the Department of Defense: the Department of the Army, Department of the Navy, and Department of the Air Force. Since the beginning of World War II, the medal has been awarded for, "conspicuous gallantry and intrepidity at the risk of his or her life, above and beyond the call of duty, while engaged in an action against any enemy of the United States." Arising from this criteria, approximately 50 percent of the medals earned during and after World War II have been awarded posthumously. The total awarded to date is 3,471 to 3,452 distinct recipients. Nineteen recipients have been awarded this medal twice; however, after 1917, only one Medal of Honor may be awarded per individual lifetime. Our most recent recipient is Army Staff Sergeant Salvatore Giunta, who was awarded the Medal of Honor by President Obama on November 16, 2010, for his gallantry in the line of fire on the Afghanistan battlefield. Signalman 1st Class Douglas Munro is the only member of the Coast Guard who has received a Medal of Honor for his actions during the Battle of Guadalcanal. 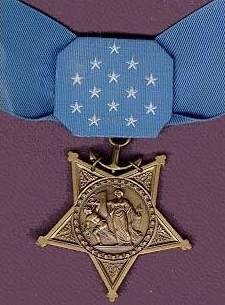 The only President to receive the Medal of Honor was Theodore Roosevelt for his actions during the Spanish American War in 1898 – it was awarded decades later, posthumously, by President William Clinton on January 16, 2001.